Due to mankind's ever-increasing mobility, exotic plant species have been extensively introduced to new locations around the world. Often these new species spread rapidly because they have no effective natural enemies in their new locations. In the U.S., it is estimated that 50% to 75% of problem weeds were either accidental or intentional introductions from other areas. For example, purple loosestrife is a valued wildflower in its native Eurasian habitats, existing in small stands and as isolated plants controlled by a complex of natural enemies. It was introduced to North America in the late nineteenth century where it now exists in huge, monotypic stands, choking waterways and crowding out native North American species. Traditional methods of weed control, such as cultivation and the use of herbicides, are not practical or desirable for such wide-ranging stands of weeds, and biological control has become an attractive strategy for control of pest weeds. Worldwide, classical biological control has successfully controlled introduced weeds on numerous occasions. In North America, there have been successes in controlling nodding thistle (Canada; Kansas, U.S.), ragwort (British Columbia, Canada; California and Oregon, U.S), klamath weed (Ontario, Canada; California, Oregon and southeast Washington, U.S.) alligator weed (Florida, Louisiana, and Texas, U.S.), and water lettuce (Florida). 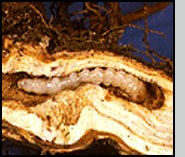 When not completely controlled, pest weeds may be reduced in varying degrees by natural enemy introductions. 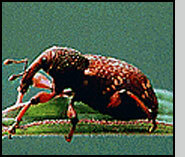 Sometimes a complex of natural enemies is used in an attempt to control a pest weed. In addition to introductions of natural enemies in the wild, biological control is used in agriculture to control weeds. Fungal products are available that attack milkweed vine and sicklepod, and Colletotrichum gloeosporioide has been effective in controlling northern jointvetch, a plant pest in rice and soybean crops. Insects can control weeds by feeding on seeds, flowers, leaves, stems, roots, or combinations of these, or by transmitting plant pathogens, which will infect plants. Other natural enemies of weeds include plant pathogens, nematodes, and vertebrates (fish). In considering species for introduction to control pest weeds, researchers first determine that the species feeds exclusively on the pest species. Other considerations include the effectiveness of control, favorable host-plant synchronization with the natural enemy's life cycle, the fecundity of the natural enemy, and its heartiness. Researchers have also determined that a successful introduction is more likely if the new locale is similar in ecology and climate to the area of origin, and if trials are made where population densities of the pest plant are similar to those in the new location. The reasons for success or failure are not yet well understood. Using biological agents for weed control is beneficial because there is less overall expense compared to herbicidal sprays. Once a population of biocontrol agents is established, minimal effort is required to conserve it. Also, the use of natural enemies does not require a high level of technology. Another major benefit is that natural enemies are less disruptive ecologically and so natural biodiversity is maintained. North American introductions of weed-feeding natural enemies have ranged from very successful, with a 99% reduction of the pest species, to complete failures, with the introduced species unable to become established in the new location. 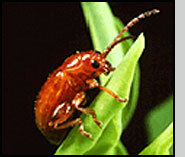 Predators, parasitoids, or pathogens of the introduced species in the new location may limit its ability to control the pest plant. Thanks to Bernd Blossey for suggestions that greatly improved a previous draft of this page. Blossey, B. (1995) A comparison of various approaches for evaluating potential biological control agents using insects on Lythrum salicaria. Biol. Control, 5: 113-122. Delfosse, E.S. (Ed.) (1988) Proceedings of the VII International Symposium on Biological Control of Weeds. Istituto Sperimentale per la Patologia Vegetale, Rome. 701 pp. Julien, M.H. (Ed.) (1992) Biological Control of Weeds. A world catalogue of agents and their target weeds. 3rd edition. C.A.B. International Wallingford, UK. 186 pp. Emge, R.G. and Templeton, G.E. (1981) Biological control of weeds with plant pathogens. In Biological Control in Crop Production. (G.C. Papavizas, Ed.) Allanheld, Osmun and Co., London, UK. 461 pp. Crawley, M.J. (1989) The successes and failures of weed biocontrol using insects. Biocontrol News Info., 10: 213-223. Lawton, J.H. (1990) Biological control of plants: A review of generalisations, rules, and principles using insects as agents. In "Alternatives to the Chemical Control of Weeds," Proceedings of an International Conference, Rotorua- New Zealand, July 1989. (C. Bassett, L.J. Whitehouse, and J.A. Zabkiewicz, Eds. ), pp. 3017. FRI Bulletin 155, Ministry of Forestry.